Welcome to Border Park Organics. We’re on a great journey as a family and we’re thrilled to share our story with you. 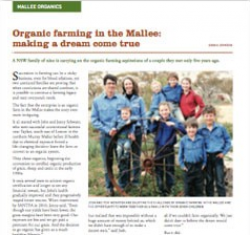 Below you’ll find out all about the farm, why we love organics and even a few newsy articles about us. Enjoy! In April 2016, Josh and Peri McIntosh and their family purchased Border Park from John and Jenny Schwarz after a 3-year mentorship. Border Park is a 2,393 ha certified organic mixed broadacre farm in the Riverland and Murray Mallee districts of South Australia. It is located about 50km SE of Loxton in an agriculturally rich region of South Australia. We produce certified organic cereal crops, cattle, sheep and wool which have been certified organic by the National Association for Sustainable Agriculture, Australia (NASAA) since 1996 – 1998. The farm has an 8km frontage to the SA –Victoria border, and adjoins Victoria’s 6,330 km² Murray Sunset National Park. Annually our rainfall is 250mm (10” in the old imperial measurement), and we are continually striving to be water efficient and to minimise the moisture loss from our soils. 60% of this rainfall typically falls in winter over the cereal growing season. The mighty Murray River provides our farm with water for troughs and farm use. Josh and Peri McIntosh commenced certified organic management of the farm as Primary Producers in 2014 with NASAA. Border Park Organics was established as a business partnership between Josh and Peri McIntosh in 2013. Our main enterprise is cereal cropping. We supply Laucke Flour Mills with organic wheat and rye, which is milled to make organic bread-making flour. The sheep and cattle enterprises have been a long established complementary addition to the cropping. Historically, most of the stock grown on the farm have been sold live on the conventional market. However, with the rise in awareness of healthy food choices, we are now channelling more effort into providing our customers with the opportunity to purchase organic, pasture-fed meat. small quantities of Organic wheat and rye for home milling. individual fleeces of Organic medium – fine wool for craft or other uses. Please enquire by email if you are interested in purchasing any of these items. If you haven’t already, we hope that you will discover for yourself the benefits of Border Park Organics and make us your source for organic, pasture-fed meat. Our family consists of Josh and Peri McIntosh and our 7 children. Both Josh and Peri had the benefit of growing up on farms in North Western NSW. (Josh is a 6th generation farmer and Peri is an 8th generation farmer). When both family farms were sold soon after we were married, it seemed unlikely we would be able to return to farming to raise our own family due to rising land and input costs. While living and working in Bathurst, NSW, we began our own family. And while we were feeding those little ones (as is often the case), we became increasingly aware of the benefits of the wholesome foods that we grew up with. Gradually some of our children experienced health concerns, and we began to question what we’d begun to accept as a ‘normal’ diet. The answers we discovered subsequently led to an interest in organic food production and procurement. Along with involvement in various organic food co-ops, we grew vegies and fruit and had a house cow on our little hobby block. It was just when we had let go of the idea of pursuing a farming career, that we were told of a couple who were looking for another young couple to take on and purchase their organic farm. And so, after much prayer and an initial visit, the McIntosh family moved to South Australia in 2011 after 10 years in Bathurst. The Schwarz and McIntosh families worked out a succession and purchasing plan that led to share farming and purchasing of the Schwarz’s farm, Border Park. Along with a passion for the land and strong family values, a shared faith in God has been the foundation that has made the succession possible. Both families are thankful to God for his provision. In other words, we’ve been fortunate to call Taplan our home since 2011. We have felt so welcomed into this community, and have been amazed at the generosity and community-mindedness of the folk in this area that we now call home. We were featured in SANTFA’s magazine The Cutting Edge (January 2016) and in two articles in The Stock Journal (November 2016). Click the links below to open or download the articles. Alternatively, read the online article. We were also featured in NASAA’s Organic Insights e-mag. In 1973 John started farming 3,874 acres with very little experience and even less machinery, having bought into the Northern Mallee after living in the reliable Freeling district. After marrying Jenny in 1974, they moved into a run-down old stone home dating back to the pre 1920s. Although they had electricity, it was somewhat of a culture shock without an automatic telephone, having to collect mail and bread from the train at the nearby Nadda railway siding, and living 50km from the nearest town. Their first cattle herd consisted of two cows from a dairy dispersal sale, and a stock mortgage enabled them to buy some Merino sheep. During those early years with little cash flow and a large debt, they aimed to be self sufficient in all ways with 20-30 laying hens and a productive vegetable garden – water was not a limiting factor then. Fruit trees provided fresh fruit, jam and preserves, and the dairy cows provided fresh milk daily, which also yielded cream and homemade butter. Due to an abundance of rabbits, their meat intake was primarily this “underground mutton”. This was all part of farm life. During the 1980s following a mishap in handling chemicals, they realised the dangers of farming in this way when John’s health was severely compromised. Physically unable to continue using chemicals, God challenged them to take on a totally new farming system. By 1990 they began pursuing ways to continue farming but without the use of artificial fertilisers and chemicals. In 1996, after lots of questions and trials, NASAA persuaded them to apply for organic certification. The final encouragement was from their grain buyer, Laucke Flour Mills, who now required organic grain. John and Jenny achieved full organic certification for cropping and livestock – beef cattle, merino sheep and wool in 1998. Since swapping artificial chemicals for natural farming systems, John’s health has improved significantly. Both John and Jenny continue to praise and thank God for His love and directional guidance, as they testify “This had to be His idea, as it wouldn’t have succeeded without Him”. When John and Jenny first gained certification for their sheep and cattle in 1998, John approached the Loxton Abattoir about becoming organically certified so they had close proximity for slaughtering. 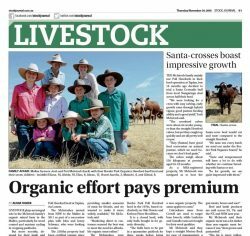 Initially John and Jenny sent organic beef carcasses to Barossa Fine Foods in Adelaide, and the odd sheep or steer were sold by Hygenic Meats in Loxton, until they dropped their organic certification. 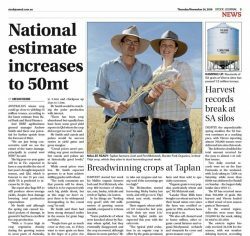 This led onto setting up a company with other growers to market and coordinate sales of organic meat for SA consumers, with support from the SA Government. During this period John and Jenny also began offering bulk orders to friends so chemical-free meat could be bought at a price parents could more easily afford. They were passionate that children have access to more meat in their diets, and as their own children and grandchildren moved out of the Riverland, this method of providing bulk meat began to naturally grow. The first bulk meat ‘orders’ were delivered personally by John and Jenny to Adelaide and Bendigo, before more efficient ways were discovered. To help keep commercial freight costs viable, freight was shared by a small network of other interested customers. Initially in the Riverland, the opportunity of bulk meat purchasing was offered to business associates, families and their friends. The customer database spread by word of mouth. True to John and Jenny’s generous nature, occasionally the last beef quarter was made available to be shared by charity groups if a customer was not found to fill the order by the deadline. Although selling bulk meat has often proved to be a stressful process, they didn’t lose sight of their original idea to make purchasing organic meat affordable for families. See all we offer at Border Park Organics or use our custom filter to view all our products at our online shop. You can also peruse our yummy recipes for great meals or view our blog posts for interesting articles and updates. Drop us a line via the contact form if you have any questions. Special shout out to SEO WEB Designs for website design and the setup of our online store.